This is a really delicious take on the classic chicken a la king that is foolproof and quick and easy to make. Place your pan on a moderate heat and add a tablespoon of olive oil. Add the chicken strips and cook for a minute or 2 until fully sealed. Add the sliced onion and fry for a further 2 minutes. Next add the pepper, celery and mushrooms and fry for a further 2 to 3 minutes. Gradually add the flour, stirring continuously for about 2 minutes. Begin adding the milk stirring all the time until you have a nice smooth texture in the sauce. Add the cream and stir until the mixture is hot (not boiling), then reduce the heat to low and simmer for 5 minutes, stirring occasionally. 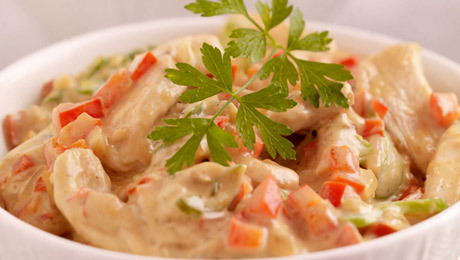 To serve, place the rice on the plate and top with the delicious, creamy, chicken sauce. Hi, am making this for big crowd for birthday next week, wondering how best to cook as planning to serve food for three but wanted to prepare early. Also what's total cooking time? Because the dish contains cream we wouldn't recommend cooking it before-hand. Reheating cream can cause it to split which might ruin your dish. This recipe takes as long to cook as the rice (approx 20 mins). To save time you could have all the ingredients weighed out and all the veg chopped. Keep them in the fridge until you need to start cooking. Hi Stephanie, we checked with Kevin and he recommends using 60g/2oz plain flour. However you can adjust the amount of flour to suit your taste. Let us know how you get on. Are you sure its 60g flour, the dish just tastes of flour. What can you put instead of the cream as we are slimming? Add the chicken and cook for a minute or two until fully sealed. Add the sliced onion and fry for a further minute to two. Next add the pepper, celery and mushrooms and fry for a further 2 – 3 minutes. To serve, place the rice on the plate and pour over the chicken sauce, sprinkle with some freshly chopped parsley if desired. in the recipe it says 350 ml SuperValu Cooks Ingredients Salt and Pepper &amp; 125 ml SuperValu Full Cream Milk. I take it the 325ml is for the milk? Hi Janet, apologies about that. You are right, it's 350ml of milk. Thank you! I shook in about 1 tbsp of plain flour when frying off the chicken (to thicken the sauce a bit later). I finished the sauce with milk to the consistancy and amount I wanted. I added 2 crushed cloves of garlic. I put in a green pepper. It was delicious and the flavour is much improved although it may not be "chicken a la king" now! The cream may be put in at the end or left out to leave it lighter. Not strictly needed. Keeps very well in fridge for a few days. Kevin did not mention when to use the butter..Also no mention was made of cream in ingredients .Luckily I make this dish but now add extras as Kevin suggested e.g mushrooms,celery and red peppers.Realise it was an oversight or printing error...Thanks for recipes. Hi Rita, we've added cream to the ingredients. In the video, Kevin adds the butter to the pan for frying the chicken with a little oil. The oil allows you to cook the butter at a higher temperature. Hope that helps!